There are games we love, games we like and games we hate. There are games that are good, but just grow stale over time or are replaced by something new and/or better. I think everyone has this game or even more than one. Tell us all about it! 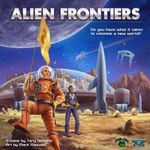 I loved Alien Frontiers because it is accessible and I think the dice ships are a cool idea and the dice themselves are nice to the touch. In addition to this, the game is often a close call and there are decisions to be made with a little bit (but not too much) of take that. I loved it so much that I supported the kickstarter project for the Factions expansion and I loved how all those goodies piled up to what was sure to be an even better playing experience. I was less than impressed....I thought that the factions are just not balanced, the game became more fiddly and complicated than was good for it IMHO due to the new abilities that are on different player boards. In addition to this the new colony tokens with the domes just looked somehow cheap compared to the simple elegance of the former wooden colonies. Even though I could at anytime just go back to playing it without the expansion and with the old tokens, this experience somehow ruined it for me. There was this one session that made me never play it again and eventually sell it. 6 or 7 players. God knows how many hours. In the end people left the table for TV saying:"if someone is about to win call me". And that was with a (usually nice) group of gamers. It was just the most horribly gaming situation that could arise I guess. Noone wanted a shared win and noone wanted to stop before ending it. *sigh*. Oh well poor Illuminati. I kinda miss you.